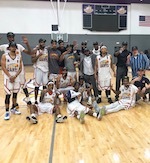 The ABA #1 Ranked Southeast Texas Mavericks (9-0) won their 20th straight ABA Regular Season game on Thursday night at their NJEC Arena in Winnie, TX as they decisively defeated the Houston Red Storm 155-79. The Red Storms started well first led by guards Christian Sonier (6'0''-G, college: Prairie View A&M) and Demetrius Blair (6'1''-G-80, college: Texas Tyler), but it was all downhill from there. The Mavericks regained the lead at 4-3 and never looked back. The Mavs cruised to 36-24 lead at the end of the first quarter. The Red Storm tried valiantly to stay in the game, but a 35-19 second quarter put the Mavericks clearly in control of the game as SETX led 71-43 at half-time. The Mavericks came out blazing in the third quarter and scored 51 points in the period to blow the game completely open. In the final period the Mavs played with consistency and controlled the final quarter with efficiency to go on to win their 9th game of the season. The Mavericks placed eight players in double figures: DeSean White (6'8''-F-86, college: Northwood Fl.) collected another double/double with 26 points and 17 rebounds. Odell Bradley (6'4''-F/G-81, college: IUPUI) also had a double/double with 12 points and 10 rebounds. 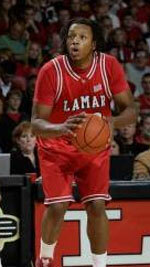 Alex Sanders (6'7''-F/C-75, college: Louisville) scored 23 points on 11 for 11 shooting from the floor. Sharp shooting Currye Todd (6'4''-G-85, college: Lamar) scored 18 points. Josh Pace (6'6''-G-83, college: Syracuse) and Lamar Sanders (6'6''-F-84, college: Lamar) added 17 points each. Jermaine Blackburn (6'7''-G/F-83, college: Boise St.) and DeRon Rutledge (6'6''-F-75, college: Tex.A&M-Kingsv.) both chipped in 15 points each respectively. This is the second time in three seasons that the Mavericks have won 20 straight regular season games. Last season the Mavericks set the ABA record for consecutive regular season game victories at 30 only trailing the Los Angeles Lakers 33 game regular season win streak from the 1971-72 season. The Mavericks will look to continue their streak as they travel to the Mississippi Gulf Coast to take on the Gulf Coast Flash next Tuesday night at Harrison Central High School. Tip-off is scheduled for 7:00 PM.